When baby is finally quiet it should be a relief, not a worry. At LEVANA, we know how tempting it is to check on a soundly sleeping infant over and over again — just in case. We are proud to bring you Oma the portable, battery-powered movement monitor that can easily be used everywhere you and baby go. Breathe easier knowing the LEVANA Oma will be there to help you check in a little less and relax a little more. 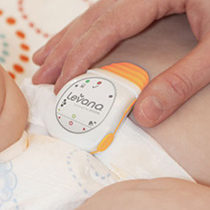 The Oma monitor clips snugly onto baby’s diaper and senses baby’s tiniest movements with a soft, flexible sensor at the belly button area. Because your baby is in constant contact with the sensor, it is unlikely to give a false alarm, unlike an under-the-mattress monitor. Knowing you will only be alerted if the situation is critical will help you feel more at ease during baby’s deepest sleep. If the sensor detects more than 15 seconds of complete stillness, Oma will beep loudly to alert you that your attention is required immediately. Oma can also be set to detect weak and irregular movements. 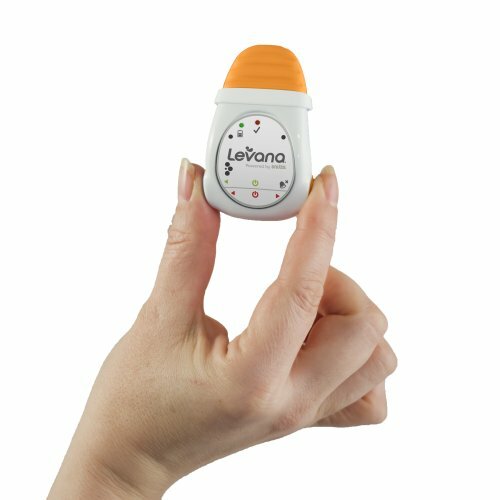 If abdominal movement is occurring less than 8 times per minute the movement indicator light will flash orange and a different warning tone will sound. This feature is enabled by default but can easily be disabled. No need to disassemble and reassemble a movement monitoring system every time you head to the grandparents’ house. Oma movement monitor is compact and battery powered, so you can easily pack it up and take it with you wherever you go. Additionally, because there are no wires, Oma is safe for use in Moses baskets, bassinets, and playpens. Q:How often do you have to change the batteries? I haven’t had to change the battery yet. I have had this monitor for four months now and use it every night and the battery that came with this product is still going strong! Q:Will this item still be effective if your baby is swaddled tightly? Yes, we use Gerber swaddlers with Velcro strips and put them on very snug. Have had no problems. The monitor will register the slightest movements. Q:quick guide manual says alarm goes off after 15sec of no movement. i just tested mine and it goes off after 21sec. is this normal? is manual wrong? We have actually had it go off sooner than 15 seconds. I believe it is looking for absolutely no motion — even breathing or panting will delay the response. Q:Will it work if baby is sleeping on their stomach? Yes it will. It senses the rise & fall of the baby’s breathing on their belly so it’ll still work. Q:Does monitor have to be worn, or can it be beside baby in the crib? It has to be worn to work. Q:What are the differences between the Oma and the Oma+? Thanks! The Oma only has an audible alarm if it detects no or irregular movements. The Oma+ will vibrate first to encourage the baby to resume or regulate breathing before sounding the alarm. It’s like a first response system before the parent is woken up in the middle of the night should the monitor detect any breathing irregularities. Q:Can you clip this to the back of babies diaper for stomach sleepers? Thanks! Hello, I don’t think so, because this detects the movement of the baby’s belly, as it moves when the baby breathes. But in the back it doesn’t feel the same, and probably you’ll get several false alarms. Q:Whats the difference between Snuza Go and Levana Oma besides the fact that Levana is newer? Functionally, there is no difference, the Oma is the Go! repackaged. Levana bought Snuza earlier this year, and kept the products exactly the same, except for repackaging to bear the Levana brand name. 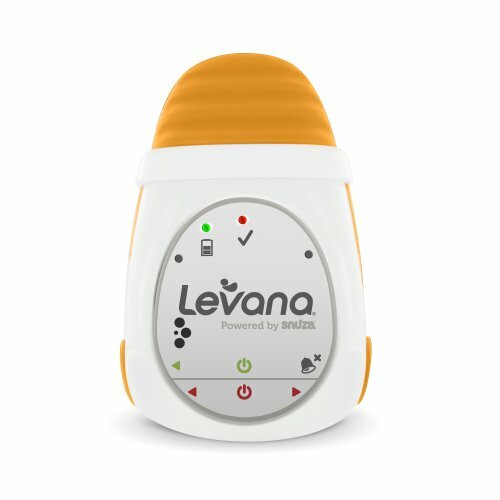 You can view the press release announcing the merger at http://www.mylevana.com/Press_Release/Baby_Safety_Brands_LEVANA_SNUZA_Announce_Technology_Licensing_Partnership.eng-9.html. If you are buying the Go! from retailers that still have it in stock, it can be considerably more expensive than the Oma, particularly as Levana has had several discounted sales to promote their new partnership. Q:Does this model have the green light that blinks when the baby breathes like the Snuza Hero? Yes. You can see the light blinking through clothes too! I use this device everyday. I wish I knew of this device with my toddler, I would have slept better!! Q:How does it work on newborns if umbilical cord stump didn’t fall off yet? The monitor doesn’t necessarily have to be in the middle of the stomach. My wife and I put it towards the side until the umbilical cord fell off. As long as the sensor can rise and fall with the breathing it will work without a problem. Q:How to you change the clip? You need to place your finger between the Clip and Oma. Get your finger as far up as possible under the clip and pull gentle outwards. This will pop off. You will need to apply some force to achieve this. Q:How does the motion sensor work? What does it use to detect movement? It detects the rise and fall of the belly. 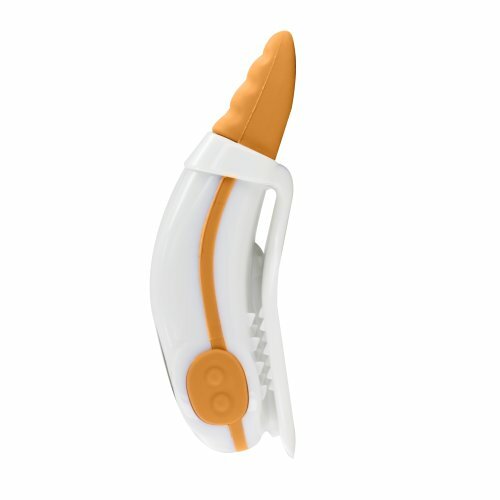 The small orange tip is super flexible silicone type material. It’s very effective as long as it is securely affixed to baby’s diaper. We’ve been using ours for 5.5 months now and I love it! Baby seems comfortable wearing it as well. Q:Will this be useful for my 6 mo old baby who moves around a lot at night? She is about to roll & concerned she will roll on her face & not turn back. I use it for my 6 month old. He moves a good bit at night and can roll over. It usually stays on the diaper if secured correctly. If he rolls over or moves in a way that it falls off, the alarm will sound. It should give you the peace of mind you are seeking. Q:Can you use this in a swing or rock and play? And, is there any kind of waterproofing to it since it goes on a diaper and babies do have leaks? Yes, my baby still wears this in a swing or on a rock and play. And it is safe from diaper leaks. I love this product . Helps me not to get too paranoid and too worried but of course I don’t rely on it 100%, I still check my baby from time to time. Q:Can you use this in a swing or rock and play? It’s likely that the motion from either can give a false read. I believe the instructions specified baby should be in stationary item. I think it also suggest against car seat. Q:Any tips for avoiding false alarms? Ours goes off every night and the baby is fine. We experienced 3 false alarms on the second nite because I put it more to the side of her stomach because she rolls over to sleep on her stomach as soon as we lay her down and I thought it would be more comfortable but I guess it didn’t have good contact. So best advice is make sure it is in the middle and put the diaper on as snug as you comfortably can. I also usually put our baby in a onesie and then in a sleep bag so I think the onesie helps keep it in place as well since she is a little wiggle worm! Last thing I can think of is the thickness of the diaper, I noticed that some diapers are thinner and it won’t stay on those as well (we use L*vs and I fold the excess down over the tabs). Hope this helps, I love our snuza, it’s the only way I sleep peacefully at night (I know that she is being monitored). Good luck! Q:Is there a way to change the volume of the alarm (ie, after 5 sec of no movement after rouse warning)? It’s quite loud now. afraid of false alarms..
Not that I am aware of however it may stop functioning all together after 3 months. Mine did just one week after the return/exchange period. Q:We had a Snuza Go with our first, and it had the ability to make a “chirping” noise with each sensed movement. Does the Oma have this feature? Q:How loud is the alarm? We live in a 900sqft apt, so could I potentially hear it in another room (closed doors) or only over an audio baby monitor? Q:Can you use this in the car (baby is in carseat) or would the movement from the car make the sensor think baby was breathing even if he/she wasn’t? It reacts to basically any movement. I would not use it in the car. Q:Is this worn on diaper under pjs? Would it work for swaddled baby? Thanks! Yes, but it will dim the sound of the alarm so you want to make sure there aren’t too many layer over it. Q:How do i buy a replacement battery? What exact size does it take? Q:Is the clip able to openwide enough to fit on cloth diapers?